Our Stratolaunch plane is the largest in the world. But it takes off and lands from a runway just like any other aircraft. Once it reaches a cruising altitude of 35,000 ft (10,668 m), one or more launch vehicles are released, allowing for rapid constellation deployment to different inclinations. As the launch vehicles ascend into orbit, the Stratolaunch plane heads back to the runway to reload for its next mission. When it comes to choosing your launch dates, orbit and inclination, the sky is just about the limit. With Stratolaunch, you launch on your timeline and your terms. If you don’t want to reserve the full capacity, you can “rideshare” with another payload. Thanks to our maneuverable launch vehicles, a single mission can serve multiple orbits and inclinations, so you can get your satellites into space efficiently, begin solving problems and start your revenue flow. Fixed-range launches are just that… fixed. With a mobile launch platform, you can avoid delays. Unlike traditional ground launches, the Stratolaunch aircraft can take off from dozens of U.S. runways. Our air-launch system allows us to avoid hazards like bad weather and conflicting fixed-range launch schedules (which often result in costly delays or cancellations). Rain or shine, Stratolaunch gets your payload to space on time. Your big ideas shouldn’t have to wait. With 12 or more missions per year, we’re ready to launch when you are. While fixed-range launches are typically scheduled years in advance, Stratolaunch can have your satellites in orbit in months — meaning booking space for your payload is just about as easy as booking a seat on a flight. Running late? We can accept your payload mere days ahead of launch. The innovative dual fuselage and high-wing design allow launch vehicles to release from the aircraft centerline and below the wing for a much safer deployment. Six Boeing 747 engines allow for a payload capacity of over 500,000 lbs (226,796 kg). The reinforced center wing provides lift, stability and pylons that can support multiple launch vehicles weighing over 500,000 lbs (226,796 kg), providing access to any inclination for multiple payloads. Built by American aerospace company Scaled Composites, the plane uses proven 747 engines, avionics, landing gear and flight controls for utmost reliability, while its all-composite structure maximizes range and lift capacity. With its strong track record of over 35 successful launches, Pegasus provides dependable access to orbit. A new medium-class air-launch vehicle optimized for short satellite integration timelines and flexible launch profiles. A three-core MLV variant with capability to deploy heavier payloads to orbit.  A fully reusable space plane that enables advanced in-orbit capabilities and cargo return. Initial designs optimized for cargo launch, with a follow-on variant capable of transporting crew. As satellites get smaller and easier to build, the number of organizations that can take advantage of space is growing exponentially. The problem is: advancements in launch capabilities haven’t kept up — and satellites are stuck on the ground as a result. Stratolaunch is ushering in a brand-new way to reach space. What was once the final frontier will now be as accessible as a commercial flight thanks to our versatile air-launch capabilities and our revolutionary aircraft and launch vehicle designs. By taking off from a runway, we can circumvent bad weather, air traffic and other variables that cause delays with traditional ground launches. So we’re able launch more quickly and more often. Our innovative twin fuselage carrier aircraft was engineered to enable deployments of a range of launch vehicle shapes and mass-classes. Ease of use, frequency and flexibility are what set Stratolaunch apart.